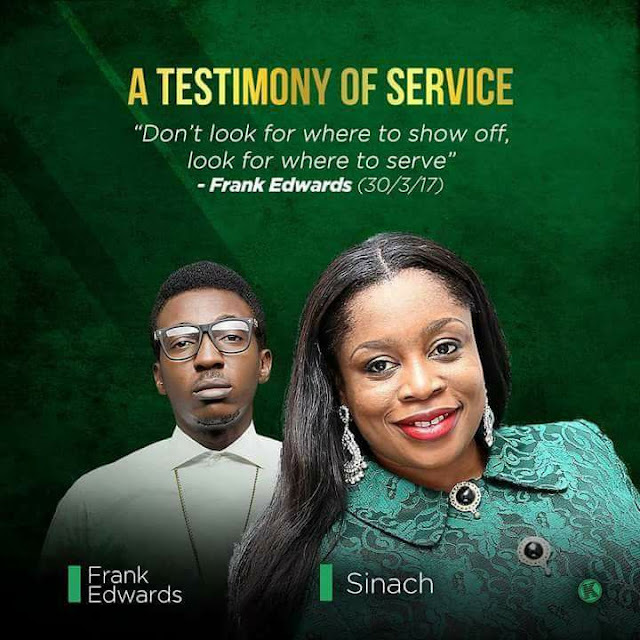 Read Frank Edward's message to Sinach. @therealSINACH is a not a house hold name , she is a world class name the results areright before you! But the question is how did she get above the sky ???? There is no studio in this Lagos that @therealsinach and I didn't visit just to make music , so from following her to studios, I began to learn music production just by watching all the engineers we worked with. 🙏🏼 After every session, she sleeps inside the vocal boot and me under the mixing console 😂 😂 😂 😂 then the next morning her car will refuse to start 😥 😥 😥 . Well well 😅 here is the good news , after I had gathered some production skills from all the various studios we visited, she decided to set up a mini studio in her house & I resumed work there as well 😂. I just wanted to make music , I just wanted to serve 🙏🏼 So to cut the long story short, today you know FRANK EDWARDS the producer , the engineer , the singer etc !! It's because of this woman 🙏🏼 she pushed me sooo hard & I humbly followed !! @therealsinach before the whole world I wanna say I love you ❤️ thank you for unlocking the greatness in me !! !...............Don't look for where to show off , look for where to serve !! It will amaze you how much you don't know ! !